The first thing which comes in our mind when someone asks us about the place of the body where stones form are kidneys. But you should know that kidneys are not the only place where stones are forming. You should know that the tonsils are another location where hard and sometimes painful stones are developing in certain people. Tonsils are gland – like structures which are located in the back of the throat. We have one tonsil located in a pocket on each side of the throat. They are made of tissue which contains lymphocytes. They are cells in our body which prevent and fight against infections. Our tonsils are playing an important role in the immune system and they are meant to function like nets which are trapping incoming virus and bacteria particles that are passing through the throat. But there are many cases when tonsils do not perform their job well. There are many cases when tonsils become more of a hindrance than a help. Tonsil stones are also known as tonsilloliths. They are hard white or yellow formations which are located on or within the tonsils. It is very common for people who have tonsil stones to not even realize that they have them. They are not always easy to see and they can range from rice – sized to the size of a large grape. There are cases when tonsil stones are causing larger health complications. There are some cases when tonsil stones can grow into larger formations which can cause your tonsils to swell and in many cases they have unpleasant odor. 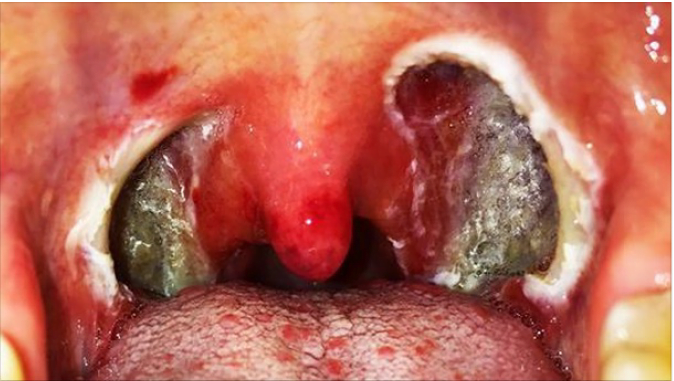 You should know that tonsil stones are not contagious. Biofilm is a material from which tonsil stones are made. In your mouth, the biofilm is a combination of fungi interacting with your mouth’s chemistry and your own mouth’s bacteria. This combination attaches itself to any moist surface. When someone has a case of tonsil stones, then the material becomes hardened within the tonsils. Plaque is another common biofilm in the mouth. It is known that biofilms are playing a role in the gum disease and cavities. Tonsil stones can cause range of symptoms but rarely they can result in serious complications. If you have frequent tonsil stones, then you should be sure to stay hydrated and practice good dental hygiene. If they are a problem for you for which you are concerned, then you need to talk with your doctor. Your doctor will help you. He or she will tell you which the best way to treat tonsil stones is and to prevent future tonsil stones. Talk with your doctor if you have some of the mentioned symptoms of tonsil stones because the early diagnosis is the best for the treatment of them. The small tonsil stones are more common than large tonsil stones. Small tonsil stones may not cause any symptoms. Complications of tonsil stones: There are cases when someone can have complication from tonsil stones but they are possible. Abscess is a deep infection of tonsil and this is one of the most serious complications which can result from tonsil stones. If you have large tonsil stones, then they can damage and disrupt the normal tonsil tissue. This can lead to significant infection, inflammation and swelling. Those tonsil stones which are linked to tonsil infections also need surgery.